Welcome to our February SOTM blog hop! This month almost 70 CTMH Consultants are featuring the build-a-flower themed February SOTM "A Happy Hello". If you've come from Lauren's Blog you are on the right track. If you get lost along the way, the complete listing of all participating blogs is found by clicking here. This bright fun card is a single layer of stamped White Daisy Cardstock perfect for popping in the mail. After stamping the half circle in layers of color, I filled in the centers using two 3" circles as a mask. It actually stamped up quickly even though it looks like a complicated design. I used our Silver Sequin Assortment to create an ombre effect - the lightest silver sequins are on the top row and the darkest are on the bottom row. I love the sentiment in this set - perfect for a thinking of you type of card. This one is going in the mail to my daughter who loves bright bold colors and funky patterns. Look how many ink colors I used for stamping! Canary, Sorbet, Pear, Gypsy, Thistle, Crystal Blue and Cotton Candy . It's a riot of color! 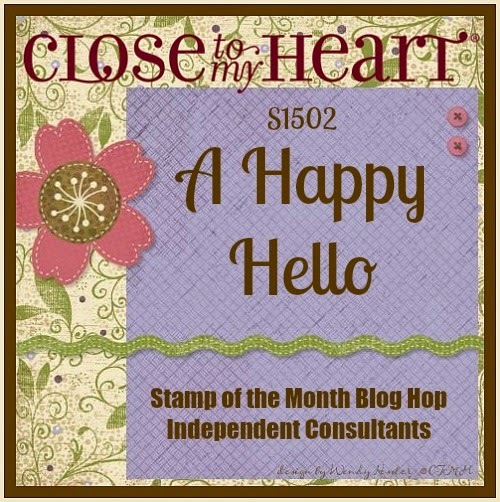 Now head on over to Pam's Blog and see what awesomeness she has created with this fun stamp set! What a wow design! Great job! What a fantastic, bright and cheery card! Love all the colors. Awesome card. Cute card! Love the colours and the black really makes them pop! Funky is an understatement. This is bold and fun. Your daughter will love it. I love the bright colors and layers. WOW.... great work on the layering!!! Wow - such bright, beautiful shapes you created. Love the look!